Maximize your “gloves-on capacity” when performing a wide variety of fireground tasks by wearing the Pro-Tech 8 Fusion Structural / Wildland Firefighting and Extrication Gloves. The gloves’ mesh-knit polymer liners are fire-retardant, breathable, resistant to blood-borne pathogens and liquids, and reduce friction during donning and doffing. Constructed of highly flexible, durable, and water-repellant goat skin suede, these lightweight gloves break in extremely quickly and remain soft and flexible, even after multiple uses and washes. 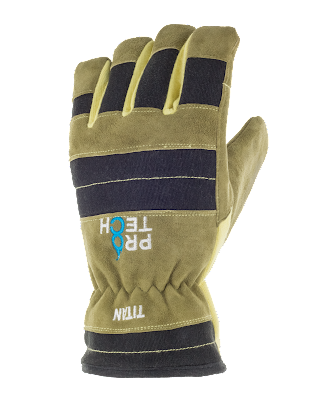 Additionally, the Pro-Tech 8 Fusion Structural / Wildland Firefighting and Extrication Gloves feature gathered stitching around the wrists, which provides a secure fit along with preventing debris from entering the glove. Interested in augmented comfort, dexterity, and flexibility? 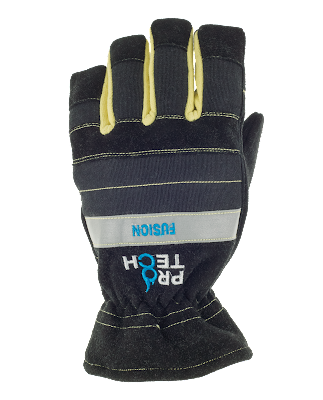 Then look no further than the Pro-Tech 8 TITAN Structural Firefighting Glove. This rugged glove is ideal for any fire ground task. Its uniquely innovative design, comprised of a durable combination of Kevlar and Nomex, gives the wearer added protection against flames, heat, hazardous liquids, and more during structural firefighting operations. Thanks to its soft, pliable, tanned goat skin-suede outer layer, the gloves will not crack, peel, stiffen, or suffer the effects of water damage. 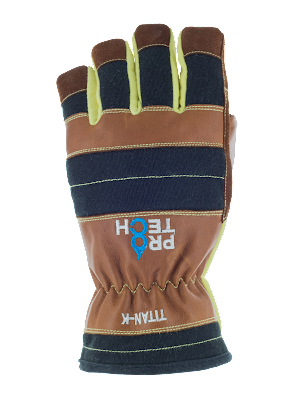 The Pro-Tech 8 TITAN Structural Firefighting Glove’s reinforced-leather inner cuff and leather pull tab allow for quick, efficient donning and doffing, and it remains soft and flexible after numerous uses and washes. Constructed from the strongest, most durable leather available, the Pro-Tech 8 TITAN-K Structural Firefighting Glove is an essential piece of equipment for structural firefighting. It features an NFPA 1971-certified Porelle FR 540 breathable barrier that offers excellent moisture and blood-borne pathogen resistance. Its palms are stitched down with Kevlar high-burst thread to ensure a strong, secure grip. Its sidewalls are constructed of Kevlar and Nomex, which increase its flexibility and dexterity, and the multi-layer, knuckle-guard system offers unrivaled thermal protection and cut/puncture resistance. The Pro-Tech 8 TITAN-K Structural Firefighting Glove is also available in a long-cuff model that is equipped with a debris blocker that extends the entire length of its body and offers superior protection at the vulnerable glove-sleeve interface. For more information on these great glove selections, be sure to visit TheFireStore.com.